Ten hours later, the answer had popped into my head. The sunlight was streaming through my windows and the air was cold enough to see my breath. In the near distance, awe-inspiring mountains soared into clear blue skies. My headache was gone. And my appetite was back. So, why trek to Everest? Not just to push myself — physically and mentally — on what is considered to be one of the most challenging treks in the world. But to experience and to see the Himalayas and Everest itself, this unspoiled sliver of land that has for years drawn in mountaineers and other adventurers. What was so intoxicating about this place? The Upper Khumbu is a region of dazzling light and immense spaces. According to the local Sherpa people, Khumbu is a sanctuary for Buddhists in times of trouble — the hidden valley will reveal itself to those in need — which many say accounts for that somewhat magical feeling that permeates it. As part of the acclimatization process, we planned to spend an additional day in Namche Bazaar, a village carved into the mountainside. Dawa recommended that we heed the oft-given advice of hiking high and sleeping low, so with daypacks we began the steep 3-hour ascent to Sengboche. At the Everest View Hotel, the “highest hotel in the world” (according to the Guinness Book of World Records), we had views of the surrounding valley — both where we had come from and where we were headed. A dirt airstrip, more ominous than that at Lukla, offered its own entertainment as we attempted to catch our breath after climbing to 12,500 feet. From here, we peered downward back into Namche as well as north — toward the towering Himalayas and imposing Everest — where we would continue our trek tomorrow. It was a slow walk back to the teahouse during which our guide, Dawa, explained how he had grown up — and come to love — the mountains that we were now hiking in. Back in Namche, we walked around the crowded village with its trekking shops, lodges, bakeries, Internet cafés and even an ATM. 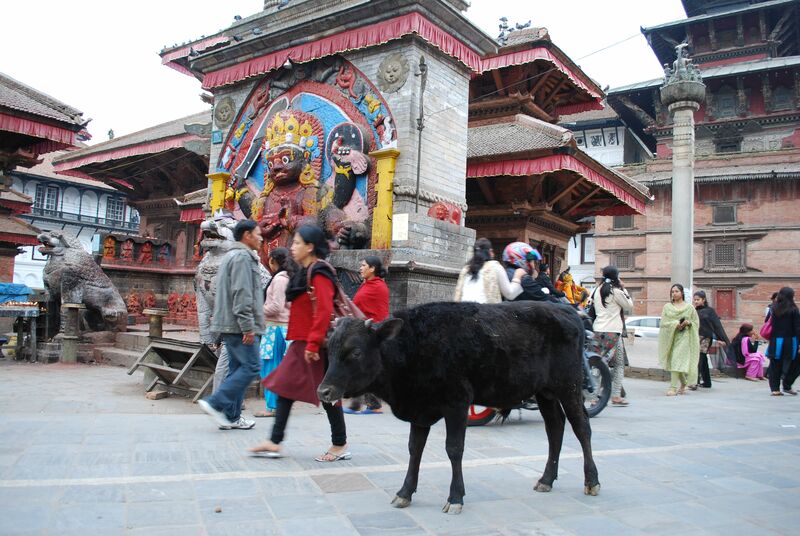 We laughed thinking how its rupees were hauled from Lukla on the back of a yak — like just about everything else here. Prices of goods certainly reflect this “tax.” A map of the region, a pen and small tub of toothpaste cost me about $10 USD. Bottled water here is about $1.25. As we ascend, the prices of everything — including the essentials like water — will soar three to four times of what they are in Namche. With late afternoon, clouds began to envelop the village. Curled up in my sleeping bag, it was time to break out my book for this trip: Into Thin Air. Several chapters in, it became apparent that it might not have been the best choice. Back at the airport at 5:30 a.m. this morning felt like a case of Groundhog Day. To make matters worse, another soupy layer of pollution hung thick over the city as the sun attempted to rise. So, it came as little surprise when the first delay announcement came. While the tension rose, there was also cause for some relief: the cause was poor weather in Kathmandu. Indeed, Dawa confirmed that the skies were clear in Lukla. By 10 a.m., the sun had burned off the fog and we were called to board our small aircraft, a Twin Otter designed to land and take-off on short runways. There were just enough seats to hold our group and 90 minutes later, we erupted into applause as our wheels lifted off. Inside the non-pressurized cabin, we ascended to 12,500 feet for the 45-minute flight. After passing the tin towns on Kathmandu’s outskirts, we soared over terraced farms at the foothills of the Himalayas. Off in the distance, we then spotted a narrow, upwardly sloped runway carved into the mountainside. Having watched the wild videos of landings into Tenzing Norgay Airport, the approach into Lukla did not disappoint. The runway is a mere 1,700 feet long, with one side 180 feet higher than the other. Needless to say, it was not the least stressful landing that I’ve ever experienced. Safe on the ground, now 9,366 feet above sea level, we handed over our bags to our porters — three zobkyo (pronounced like “joekay”), a mixed breed of yak and cow — retied our hiking boots and prepared to start our trek to Everest Base Camp. Heading through pine and cedar woods along the Dudh Kosi Valley, the steep trail initially descended a steep flight of stone steps. In this part of Nepal, there are no roads. The trail we were now following was essentially the Himalayan Highway. 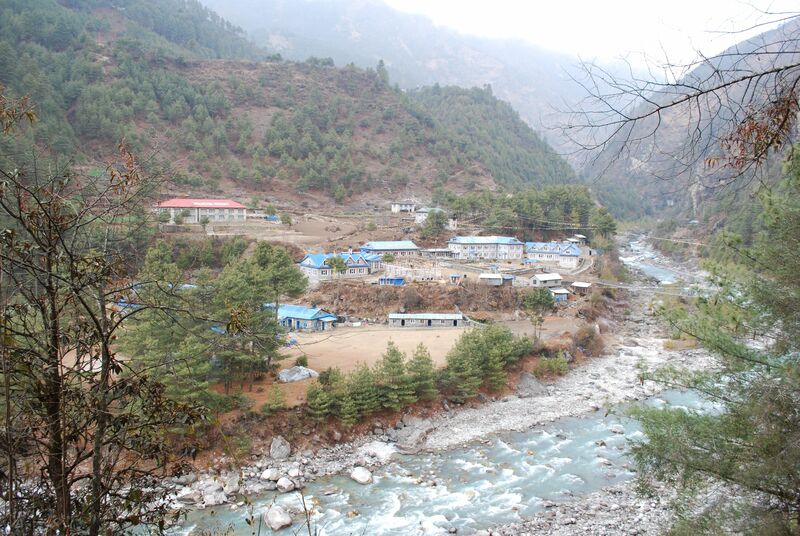 We would follow it through several dozen villages from Lukla for about 40 miles to the base of Mount Everest. The highway is subject to its own traffic: human porters and yak caravans carrying tremendous loads of building supplies, food, drinks and other goods. We passed through the small village of Cheplung. The trail was lined with rocks engraved with Buddhist carvings, pearl white stupas and colorful prayer flags flapping in the breeze. There was the near constant sound of bells tied to the necks of yaks and zobkyo. The skies were clear as we soaked in the magical scenery. We crossed several suspension bridges over gushing, crystal clear glacial water. After about 3 hours and 3 miles, the Sunrise Lodge & Restaurant, in the small village of Phakding appeared. These simple teahouses offer basic rooms and foods; they are not the reason for visiting the Himalayas. But they do offer a place to recharge and refuel on the trek. With a big day in front of us, we settled in for an early evening. Little did we know that our 8 p.m. bedtime would be the latest of the entire week. Except for the occasional burning garbage fire, the city was nearly pitch black when we set out for the airport this morning at 5:15 a.m. Some of that could be attributed to the early hour; but Kathmandu’s overloaded electrical grid necessitates frequent power cuts, often for up to 18 hours a day. Without generators, darkness sets in. At the tiny domestic terminal, we settled into some stiff plastic seats while the smell of an overflowing lavatory drifted into the waiting area. We were originally scheduled to depart on a Tara Air flight at 6:15 a.m., which given low-hanging smog in Kathmandu and overcast conditions in the mountains, was quickly delayed. 7 a.m. became 8 a.m. which became 9 a.m. Soon, the city weather cleared but the weather in Lukla remained poor. Safety has been — and continues to be — an issue when flying into the Himalayas. Most recently, there was a crash in Lukla just two years ago. The country’s aviation authorities have taken a very cautious approach to flying into the mountainous area, so while we grew frustrated as the hours ticked away, we also understood that little could be done. At 1 p.m., the garbled announcement came over the loudspeaker: “All flights to mountain canceled.” Crushed, we grabbed our bags and navigated the chaotic streets back to our hotel. After some Thai food and a couple of Everest beers to commiserate, we walked to Durbar Square, the traditional heart of the old town that once served as the palace residence of the royal family. The entire area, a Unesco World Heritage site, is comprised of temples that date back to the 17th and 18th century. Surrounding streets were brimming with vendors selling smoked fish, banana leaves and marigolds. As the city’s biggest tourist attraction, we were actually pleasantly surprised by the lack of touts — certainly there were some begging children and the harassing guide offering his services, but for the most part, we were left alone to enjoy our time there. Back at the Manang, we watched as the skies rapidly darkened and a monsoon with pelting hail and howling winds blew through the city. We hoped that this would the last of our weather woes. The nearly 12-hour time difference had all of us up at 6:30 a.m. this morning. Wanting to take advantage of the few days that we had in Kathmandu, we ventured into the quiet lobby and had a taxi take us to Swayambhunath, a Buddhist temple on the outskirts of town. Even at this early hour, the city was starting to awake: overflowing buses belching fumes; meat being butchered in the open air; uniformed children walking to school. Outside my taxi window, Kathmandu appeared to be a melding of several of the cities that I’ve visited before. Its influence was in places like Fes, Morocco and Hanoi, Vietnam. At the same time though, there was a terribly oppressing — and highly visible — poverty that I’d never before experienced. Burning heaps of garbage. Packs of feral dogs barking. Homeless women begging with malnourished infants on their laps. In my travels, I’ve been to struggling Third World countries. But after only a few hours in Nepal, it was clear that this country was in a league of its own. Not wanting the experience to be overshadowed by this, we arrived at the temple’s steps as morning devotees began to gather. The temple sits atop a hill, accessible by a steep set of stairs that brought us past burning butter lamps as the strong smell of incense and chanting prayer led the way. Monkeys played in the trees while worshippers created an almost mystical atmosphere — as the sun lit the sky. We circled the stupa with its omnipresent third eye — representative of the insight of the Buddha. Prayer flags fluttered in the wind above. The base of the stupa was ringed by prayer wheels, spun counterclockwise and baring the sacred manta: om mani padme hum. We agreed that it was a fantastic start to the day as we stuffed ourselves at the Hyatt’s fantastic $9 buffet breakfast, with its made-to-order omelets, bacon and banana bread. A few hours later, with the rest of the day still in front of us, we set out again to follow a walking tour of the Thamel neighborhood that had been suggested by Lonely Planet. During breakfast, however, the streets of Kathmandu had changed. The first sign: our taxi was covered in colored powder and water. “Holi,” our driver explained. We soon learned that our visit had coincided with this popular annual holiday (the “Festival of Colors”) in which locals bombard cars, animals, one another — and especially tourists — with water and powder. Our driver dropped us off in a small square. It wasn’t more than 15 seconds before a group of roving teenagers came running over to us. “Happy Holi!” they yelled before completing drenching us and smearing powder on our faces. John and Mike did not look happy. Yet, with encouragement, we pressed on. Now that we had been hit once, we wouldn’t be such targets, right? Not the case we learned as water balloons came raining down on us from rooftops. By this point, I’d just started telling all the kids to hit John. “He wants it! Get him” I’d yelled. Then a balloon covered in dirt barreled into his light blue Carolina shirt. Drenched and covered in paint, we started to enjoy the experience more. Laughter — both ours and that of our attackers — rang through the streets. Then, a bunch of kids nailed me in the crotch with two water balloons. “Okay, I’m done,” I said. Back within the safe confines of the Hyatt, we cleaned ourselves up and lounged poolside. Our waiter, Roberto, plied us with gigantic chicken club sandwiches and mojitos as we recovered from the onslaught. At 5 p.m., with Holi over and some order returned to the streets, we took a taxi to the Hotel Manang, where we met the group — from around the world — with whom we would be hiking to Everest Base Camp with. In experienced hands, this would be the 80th time that our guide, Dawa, would be leading the trip to the base of the tallest mountain in the world. This, he said, would be an exhausting, demanding yet highly rewarding adventure. It would require communication, teamwork and trust — but he was confident that we would each make the 75-mile trek to nearly 19,000 feet. We received our packs that would be hauled by the porters and returned to the our dingy rooms to gear up. When mine was so stuffed with gear that it could barely close, it was time for bed. Our flight to Lukla, the origin of the trek to Base Camp at the foothills of the Himalayas, is scheduled for 6:15 a.m. tomorrow. We awoke this morning to the sound of sand pelting our windows. Peering out into the vast desert — with cranes lining the skies — we saw that the winds were howling and a sandstorm was quickly approaching. Unfazed, we grabbed a cab back to the International Airport and after cups of coffee and some pastries, boarded our five-hour flight bound for Kathmandu. As we began descending into Nepal, the snow-capped Himalayas appeared outside of our windows — before being shrouded in a heavy cloud of smog and pollution that hangs over this capital city. Wheels were down at Tribhuvan International Airport just before 4 p.m. local time. We set our watches ahead 1 hour, 45 minutes of Abu Dhabi and stepped into the thick, swampy air. The sound of car horns blared in the distance. Dilapidated, half-completed structures lined the runway. Just beyond the fence, two cows scavenged for food in a pile of garbage. Nearly two days after leaving North Carolina, it was clear that we had arrived in Nepal. Visas pasted into passports and bags collected, we negotiated to have a beat-up taxi take us to our hotel. Passing through the chaotic streets, with animals, bikes, pedestrians and various motorized vehicles competing for road space necessitated closed eyes and occasional gasps. Yet, it was difficult not to want to take in the sensory overload all around us. We found relief at the Hyatt Regency, situated in its own compound. Indeed, within the walls was essentially a sanctuary, a peaceful place for us to rest after an exhausting few days of travel. 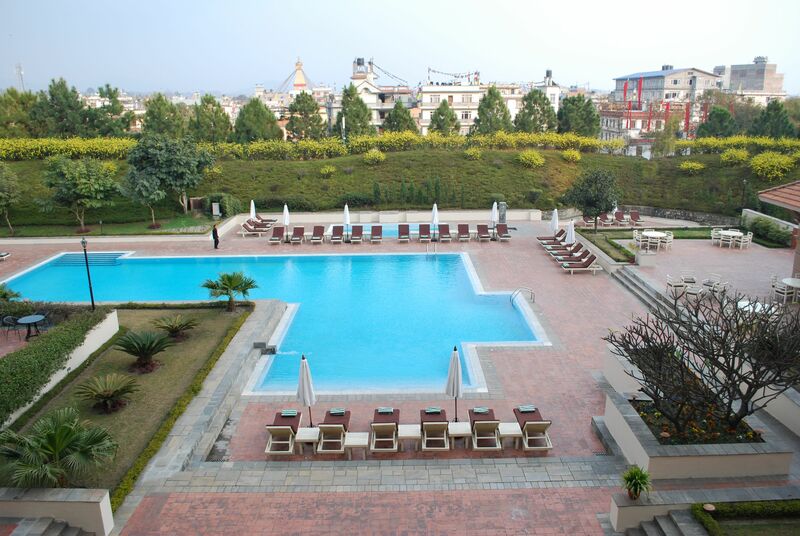 Newari water tanks led us into the stupa-lined foyer — all overlooking a beautiful outdoor pool. Up in the room, we collapsed into our beds, watched some BBC earthquake coverage and relished the rain shower. Wanting a taste of local culture, we headed into town for dinner at Thamel House, which served up traditional Nepali cuisine. We ordered a whole slew of dishes to sample, including momos (dumpling filled with meat), sekuwa (spicy meatballs), chiura (beaten rice), aloo tareko (fried potato with cumin, tumeric and chili) and choyla (roasted, spiced boar). Washed down with Everest beers and a few glasses of rice wine, and accompanied by traditional Newari dancing, we celebrated our arrival in this country. Then, jet lag hit and we realized that we should probably head back to the hotel for some rest. But not before first checking out the Hyatt’s bustling casino, packed with chain-smoking Indian tourists playing $1 hands of blackjack and sucking down bowls of soup at the table. Feeling terribly out of place though, we decided to call it a night.